With RoomSketcher, it’s easy to create high-quality 2D Site Plans. Create a clear overview of your property layout in black and white or color. Perfect for real estate marketing, landscape design, and home improvement projects. Create 2D Site Plans online with an easy-to-use site plan software like RoomSketcher. 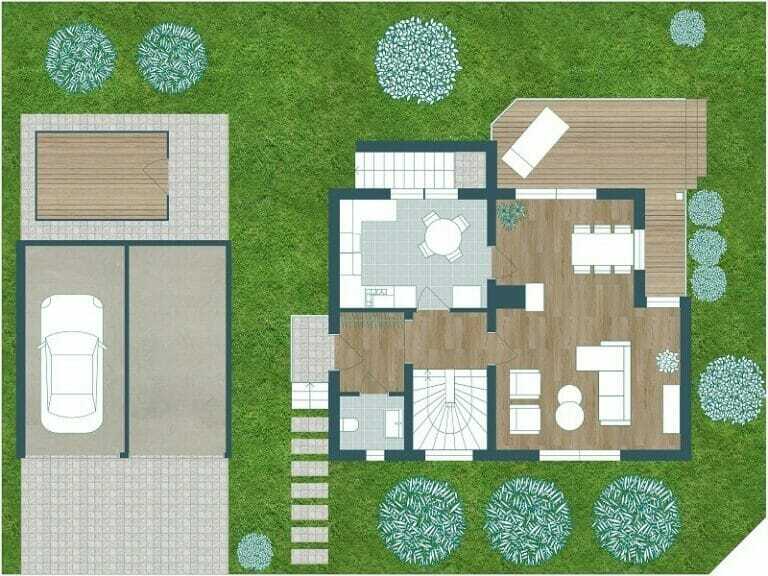 With RoomSketcher, you can create 2D Site Plans online using your computer or tablet. The easy click and drag interface makes drawing a site plan easy to understand and straightforward. No computer drawing experience is necessary. Simply click and drag to draw your property layout, and add plants, landscaping, and outdoor furnishings to your site plan – it’s that easy! Integrated measurement tools will show you the length, as you draw. Choose if you want to show length and width measurements on your site plan or zone sizes in square feet or square meters. You can also calculate the area of the whole property, just the built-areas, or only the outdoor areas, using our powerful Total Area calculator. Our high-quality 2D Site Plans are high-resolution and optimized for print and web. Create black and white site plans or color-code areas to illustrate different landscape features such as gardens, grass, walkways, and more! When your site plan layout is complete, you can print or download it to scale in either a PDF, JPG or PNG formats. 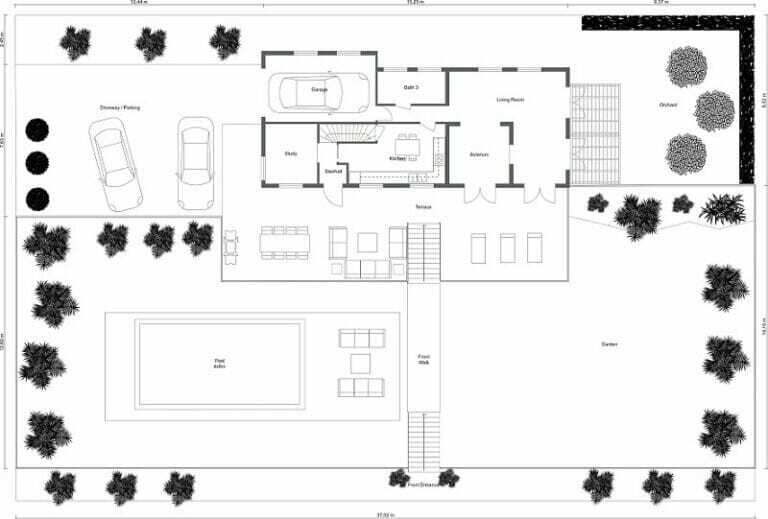 Black and white site plans have a clean, professional look that are perfect for plot plans, home and property appraisals, and applications for building and use permits. 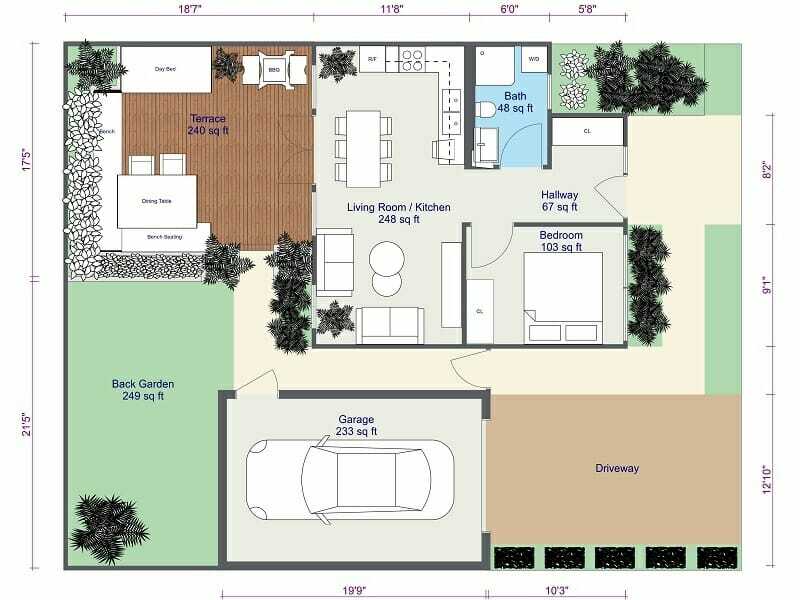 You can include the interior floor plan of the buildings on your site plan, or you can show just their footprint depending on what your needs are. Add symbols to your site plans such as a north arrow to indicate the plot orientation and trees and bushes to show planted or wooded areas. Colors is an excellent way illustrate zones and landscape features on a 2D Site Plan. You can use different tones of green to indicate gardens or lawns. Use blue to indicate water. Distinguish between different kinds of paths and walkways to indicate which have hardscape and which do not. You can also show landscaping materials such as grass, decking, and paving. Create high-quality 2D Site Plans for your real estate, landscape design, and home improvement projects. Learn more about using RoomSketcher as your Site Plan Software.